Chelsea draw 2-2 with Burnley in Monday's Premier League clash at Stamford Bridge, with all four goals being scored in the opening 24 minutes. Relive Sports Mole's live text coverage of Chelsea's 2-2 draw with Burnley, as the Blues missed out on the chance to move into third place in the table. Sports Mole provides team news, predicted lineups and a full preview of Monday's Premier League meeting between Chelsea and Burnley at Stamford Bridge. Blues star eyes "beautiful" ending to tricky season. Chelsea survive a comeback from Slavia Prague to progress through to the Europa League semi-finals courtesy of a 4-3 victory at Stamford Bridge on Thursday night. Ahead of the game between Chelsea and Slavia Prague on Thursday night, Sports Mole looks at how Maurizio Sarri's side could line up in the Europa League fixture. Sports Mole provides team news, predicted lineups and a full preview of the second leg of the Europa League last-eight clash between Chelsea and Slavia Prague. Sports Mole selects its strongest combined XI from the squads of Liverpool and Chelsea ahead of Sunday's Premier League clash between the two sides. Ahead of the huge Premier League clash between Liverpool and Chelsea on Sunday, Sports Mole looks at how the Blues could line up. Sports Mole looks at how Chelsea could line up for Thursday's Europa League quarter-final first leg against Slavia Prague at the Sinobo Stadium. Sports Mole provides team news, predicted lineups and a full preview of the first leg of the Europa League last-eight clash between Slavia Prague and Chelsea. Eden Hazard scores a goal-of-the-season contender and adds a late second as Chelsea see off West Ham United 2-0 at Stamford Bridge to move up to third place. Sports Mole previews Monday night's London derby between top-four chasing Chelsea and West Ham United at Stamford Bridge. Manchester United should move for Chelsea midfielder N'Golo Kante this summer, according to pundit Robbie Savage. Chelsea boost their hopes of a top-four finish in the Premier League with a 3-0 victory over Brighton & Hove Albion in Wednesday's clash at Stamford Bridge. Sports Mole looks at how Chelsea could line up for Wednesday's meeting with Brighton & Hove Albion, including a first Premier League start for Callum Hudson-Odoi. Sports Mole previews Wednesday evening's Premier League clash between Chelsea and Brighton, including predictions, team news and head-to-head records. A report claims that Casemiro is keen on a move to Paris Saint-Germain as he wants to link up with compatriot Neymar at club level. Sports Mole looks at how Chelsea could line up for their Premier League trip to Cardiff City on Sunday afternoon. Chelsea midfielder N'Golo Kante insists that he is fully focused on his current club amid speculation linking him with a move to Real Madrid this summer. 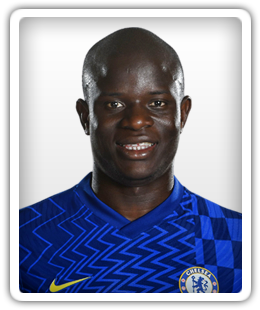 A report claims that Juventus will go head to head with Real Madrid for the signing of Chelsea midfielder N'Golo Kante at the end of the season. A report claims that Real Madrid are looking to sign N'Golo Kante from Chelsea, having also made an approach for forward Eden Hazard. Sports Mole looks at how Chelsea could line up for the second leg of their Europa League last 16 tie with Dynamo Kiev, which they currently lead 3-0 on aggregate. The Chelsea midfielder produced a brilliant bit of skill in a Blues training session. A late goal from Eden Hazard earns Chelsea a 1-1 draw with Wolverhampton Wanderers in Sunday's Premier League encounter at Stamford Bridge. Sports Mole provides team news, predicted lineups and a full preview of Sunday's Premier League encounter between Chelsea and Wolverhampton Wanderers. Sports Mole looks at how Chelsea could line up for Sunday's Premier League clash with Wolverhampton Wanderers as they bid to move into the top four. Sports Mole provides team news, predicted lineups and a full preview of Thursday's Europa League last-16 first leg between Chelsea and Dynamo Kiev. Sports Mole looks at how Chelsea could line up for the first leg of their Europa League last-16 tie with Dynamo Kiev. Sports Mole looks at how Chelsea could line up for Sunday's West London derby against Fulham, with decisions to be made over dropped goalkeeper Kepa Arrizabalaga. We take a look at a timeline of the biggest issues. Ahead of Wednesday evening's Premier League clash between Chelsea and Tottenham Hotspur, Sports Mole selects the strongest combined XI from both sides. Manchester City manager Pep Guardiola believes that his side's EFL Cup final win over Chelsea will spur them on in their quest for an unprecedented quadruple this season. Manchester City successfully defend the EFL Cup by beating Chelsea on penalties after an entertaining goalless draw at Wembley Stadium. Ahead of Sunday's EFL Cup final between Chelsea and Manchester City at Wembley, Sports Mole selects its strongest combined XI from both squads. N'Golo Kante insists that midfield teammate Jorginho is a "very important" player for Chelsea, as he urges supporters to get behind the side. Chelsea register a 3-0 victory over Malmo to progress past the Swedish side by a 5-1 aggregate scoreline in the last 32 of the Europa League.